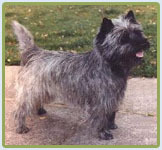 Welcome to Cairn Terrier Talk the place to chat about this wonderful breed of dog, whether you have a Cairn Terrier you'd like to chat about, or are thinking of welcoming this breed into your home. Whatever your interest in this breed we have something for you in here. It is completely free to become a member, and once you do you will have access to a range of forums discussing this breed, so come and join for friendly chat, fun and advice and maybe to learn more about this breed of terrier. Please note:~ Cairn Terrier Talk is a Strictly None Dog Selling Forum. On the Forum we do not allow any requests for puppies/dog/studs etc. Please DO NOT join to ask to buy a puppy or a dog. Any posting that contains a request for puppies/dogs or advertising (in any form) of available puppies/dogs is forbidden. People who do not abide by the rules risk deactivation of their membership.